Room J Ltd. takes it’s name from an idea that was started in the 1990’s. 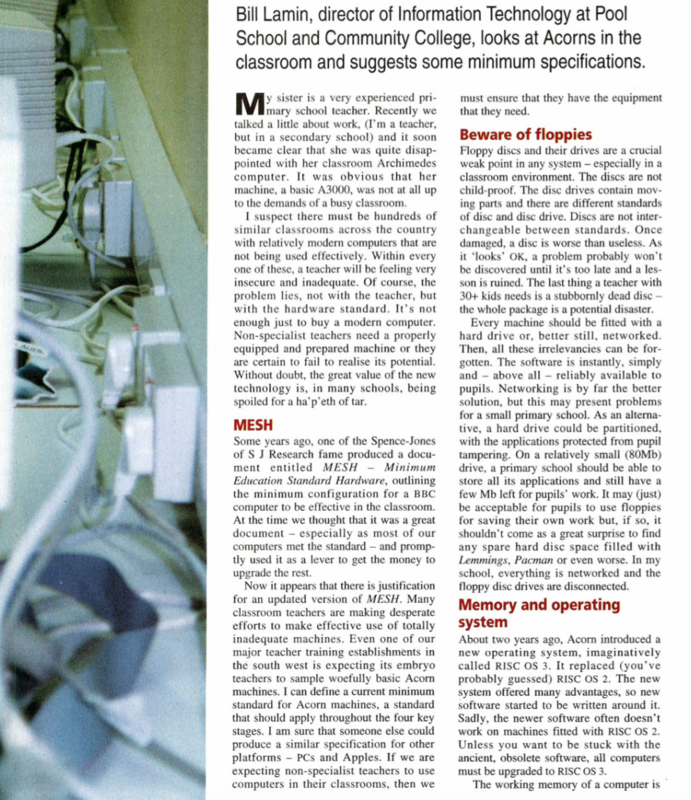 The difficulty of running a school computer network resulted in some ingenious software - the name “Room J” was used to market the software. The rooms at our school were given letters - ‘J’ just happened to be the name of our computer suite. Founded on those principals - Room J offers something relevant to today’s classroom. Not only do we develop educational apps - but we also offer an education focused installation service. 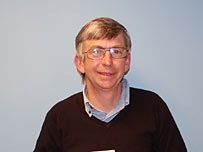 “Room J Software” was founded by partners Bill Lamin and Chris Johns in 1995. 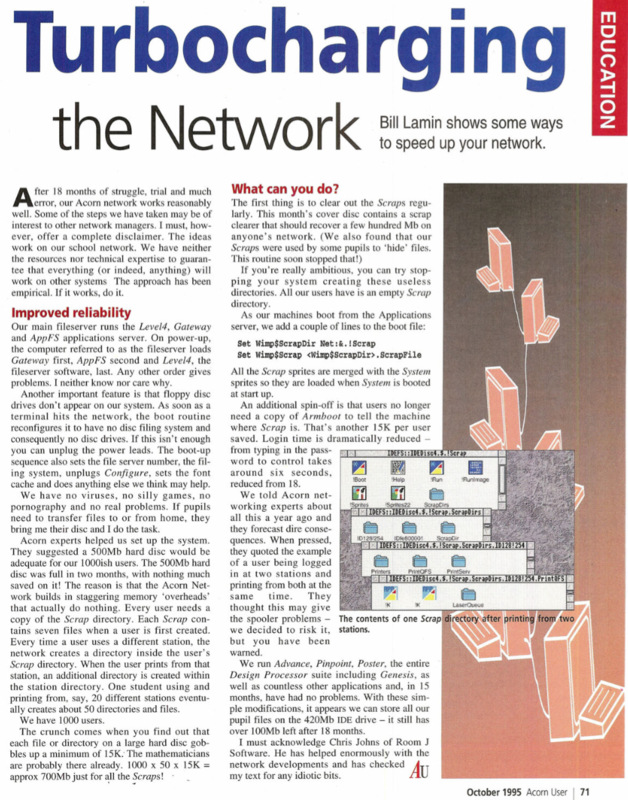 Bill ran the business until 2001. They started by selling an innovative set of programs for the Acorn range of computers. Unhappy with the &apos;Manager&apos; application provided by Acorn to carry out day-to-day tasks on the network, Chris set about developing a new program from the ground up, under the guidance of Bill. The result was the Admin Suite, popular with many school network managers throughout the country - changing passwords and adding users in bulk was now an easy task. The pair carried on with several other projects and Chris&apos; university friend, Justin Fletcher came on board to write &apos;PrintLimit&apos; in 1996 which stopped the endless reams of paper being ejected from the printer when a troublesome pupil chose to print 100 copies of their essay. 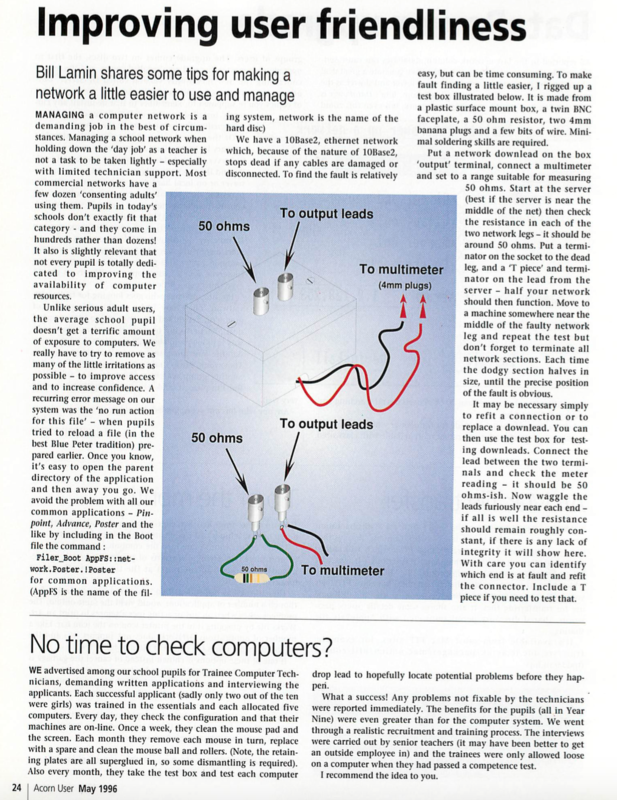 Another project which didn&apos;t quite make it to publication was the Broadcast Printing Service - designed to share printers from workstations using a hidden module running in the background, eliminating the need for hard disc based print servers. Chris and Justin moved on to persue their careers and although Bill carried on marketing the software - the era of Acorn computers was coming to an end. Adam Scott then joined the team and produced some educational titles - with Room J releasing the &apos;Sorted! 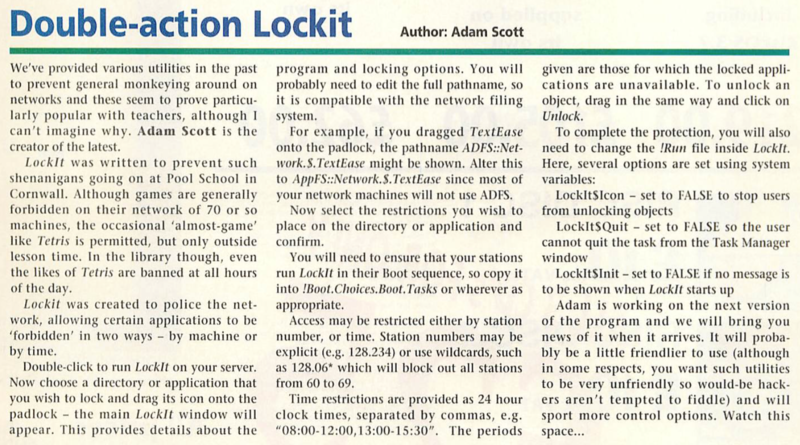 Driving Theory Test&apos; program, this time for both Acorn and PC platforms in 1998. 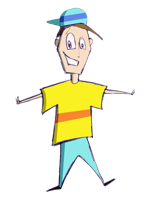 Bill was an enthusiastic Maths and IT teacher, usually working against the grain of the local education authority - sticking by his decision to use IT as a tool. He felt it was more important to learn skills than specific applications, so rather than opting for the county &apos;RM&apos; strategy, Bill took his school down the Acorn route. There was no waiting around for Windows to load at the start of the lesson, the computers were ready in less than a minute - lesson time could be spent learning rather than waiting. 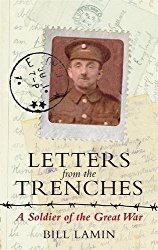 There were many ideas floating around for the next few years which Room J Software &apos;tried out&apos; on the pupils at our school - none of these titles were released as Adam also moved on and Bill concentrated on his book - Letters from the Trenches. Bill took a belated &apos;gap year&apos; and toured the world following the publication of his book, returning to educating pupils after his adventures. Sadly Bill is no longer with us - he leaves behind him many inspired people, there are new generations of people who don&apos;t follow the path as a result of his successes. Just because everybody else does it that way, it doesn&apos;t make it right. There are some exciting projects under way at the reformed "Room J" which we will soon be sharing with you. 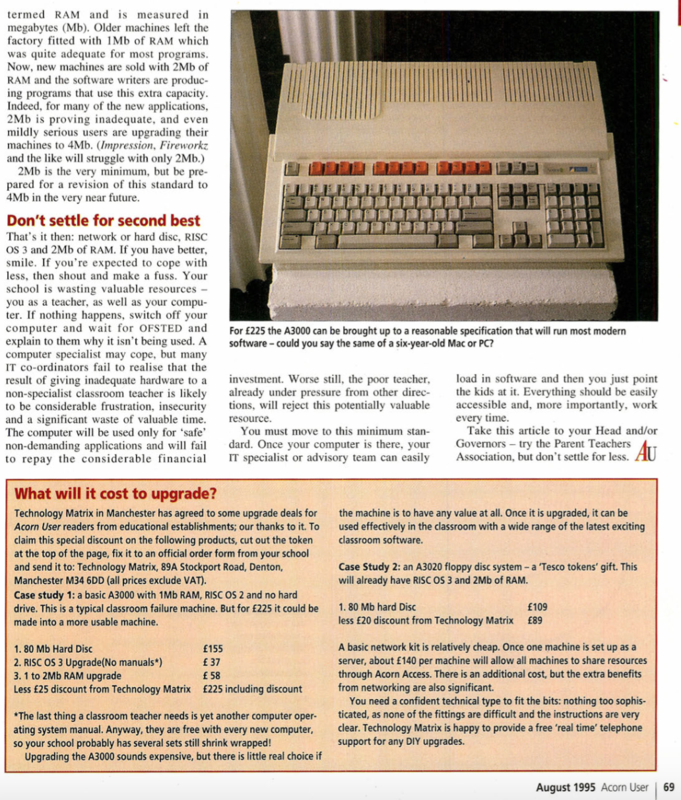 If you want to find out more, or have any memories of Room J Software products - don&apos;t hesitate to drop us an email. Cat Lamin, Bill’s daughter - has followed in his footsteps. She started out as a primary school teacher and has gone on to be well known with the Raspberry Pi community. 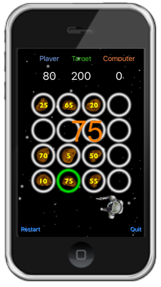 The object of the game is to claim spaces on the board by placing a flag of your colour. Each time you place a flag, you score a point. You score an additional point for placing next to an existing flag, one point for each flag in any direction. To place a flag, you must use the dice and your calculator skills to create a number that’s on the board. 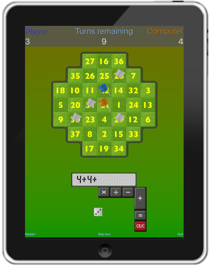 The game can be restricted to a limited number of turns, you can change the difficulty level of the computer player, and you can choose whether ‘brackets’ and ‘to the power of’ are available on the calculator. 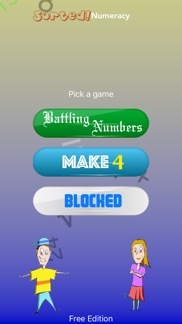 Similar to battling numbers, this time you place counters on the board, with the object being to place four counters in a row. The first player to do this is the winner. Your spaceship is stranded and your fuel has been scattered amongst an asteroid field. You need to pick one asteroid at a time to recover the fuel, each time you pick an asteroid though - all the asteroids in that row & column are removed from play for the next turn. It doesn’t stop there - for peace of mind we can offer a manufacturer backed 25 year warranty on new installations. We will need to supply matched parts so the patch panel, cable and outlets will all need to specified by us but you can be sure that if any element fails within the warranty period, it will be replaced by an authorised installer. Not confident about your IT system? We can get an engineer from one of our partners to help you with your technology requirements, with the threat of cyber security these days - it’s good to have someone on hand to help you with any concerns. We’ve got over 20 years experience of data cabling under our belts - ranging from single cables for residential properties, through to complete supermarket installations. Our services include termination of cabling - telephone, data or fibre as well as complete installation. We can also carry out testing and fault resolution. Looking for a complete installation? We’ll carry out the fitting of the dado trunking, electrical provision as well as the data, telephones and A/V requirements. Cabinet upgrades - no problem! If you’ve run out of space we can look at replacing with a larger one to include re-terminating all your existing cabling, if required. WiFi more your thing? Most of us these days require wireless connectivity for our devices, but we all know what it’s like trying to keep a good connection. We can help! 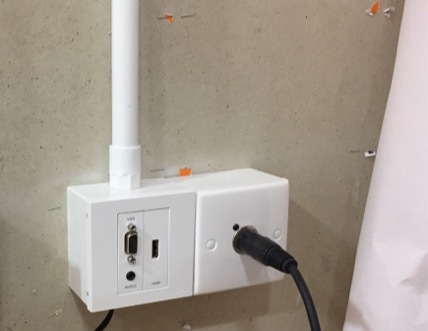 Whether it’s a discreet access point for your home office - or site wide coverage, from design to installation we’re with you every step of the way. A/V hardware plays a major part in our lives these days - take the headache out of worrying about whether you’ve got all the right cables and let us carry out the installation for you. Whether it’s a projector & screen, interactive touch screen or plain old TV - you can be sure we will carry out a professional installation - insuring that it’s fitted safely is of utmost importance. We can integrate your installation with your other hardware - including a complete control system if that’s what you want. We all like having control at our fingertips on our smartphones don’t we? CCTV? No worries - we’ll take care of that for you as well. Analogue / IP - not a problem. Smart phone integration? Sure! engineer to take a look before getting BT Openreach out. If it’s a fault internal to your property, they’ll charge you to fix it. Larger installs? 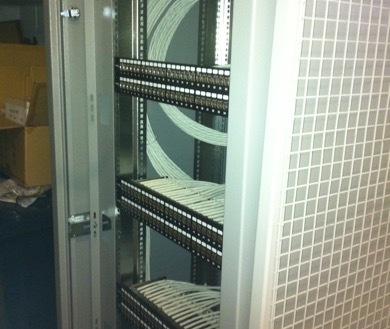 We can integrate your phones as part of a structured cabling installation as well as maintaining existing cabling. Telephone Systems - we regularly work with Panasonic and Samsung systems. If you need some changes made to your programming, don’t hesitate to get in touch, we can give you a price. If you’re looking to expand a system or need a replacement, we can help with that too. Maybe IP is your thing? We can supply IP phones as well, or sort out a SIP trunk for you if you want to add that to your existing system. 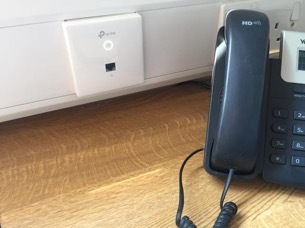 Alternatively you can go the whole hog and have a hosted IP telephone system, there’s no upfront cost - you can rent your numbers and phones. Why not drop us an email to discuss your requirements. Copyright © 2017 Room J Ltd.